I also included a picture of a Nashorn seized by Polish troops in Italy: the picture gives a good impression of the size of the propellant charge for this 88 mm variant. No wonder the AT shell had a virtually flat trajectory out till 1,000 m.
Alright, Jochen do your thing. Virkelig en skam du ikke er hjemme i forbindelse med DM i modelbygning. Kunne sgu have været sjovt! Well, the picture speaks for itself, I guess. This Nashorn is temporarily in parc fermé. Nice vehicle, though, and I will return to it. One explanation is to be found elsewhere on this blog. Well, some months down the line a brief update. I sort of expanded the Nashorn kit: on the shelf waiting was also a Dragon Hummel, so starting that one up more or less simultaneously made sense... economy of scale. After a long period of cleaning, then some more cleaning, and finally some additional cleaning, a first coat of Vallejo RAL 8012 red brown primer. These are the old Dragon kits, 6166 and 6150 respectively, and they are not brilliant: there are fit issues and a lot of ejector punch marks. But with some decent barrels and some other AM stuff, I hope to make some honest models out of them. The little boxes in one of the photos are Eduard's ammo boxes for the Nashorn and the Hummel plus the radio set for the Nashorn (the small frames on one side of one of the large boxes). Regret the quite appalling photos: will try to get more light in future photos. More to come. Last edited by Jochen; 09-16-2014 at 05:10 AM. Nice Progress you have made with TWO kits at the same time, but you are quite right that it make sence to build them together. Bloddy thing is that a good friend had supplied all the references I needed: I should just have looked carefully at the photos. Will try to fix it. Guess the same thing applies to the other model - the Nashorn? Last edited by Jochen; 09-18-2014 at 04:18 PM. Jochen, both the Nashorn and the Hornisse kits suffer from this mistake in their respective instructions. It's a shame. Hope you can fix it easily or w/o too much damage to the interior! Well, a little violence may come in handy from time to time: fortunately I use glue in small quantities, so the small buggers came off without too much damage to the interior - only a minor hole had to be putty'ed up. Some parts of the suspension, however, did not take too well to the firm grip needed, when the misplaced parts were pried off. But these can be glued on again. 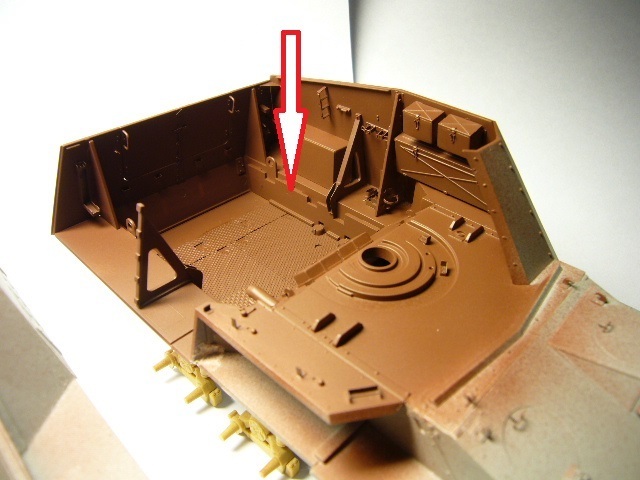 I can tell from reference photos (and thanks again, Torben... ) that the Nashorn had a forward mounted antenna socket on the inside of the right-hand side armour plate as well as MG mounts for close defence on both side armour plates. Will do those and look at wiring before returning to the paint job. Last edited by Jochen; 09-21-2014 at 05:32 AM.